I’m delighted to announce the availability of a new vSphere 6.5 core storage white paper. The paper covers new features such as VMFS-6 enhancements, policy driven Storage I/O Control, policy driven VM Encryption, NFS and iSCSI improvements and of course new limit increases in vSphere 6.5...You can download the paper from our storagehub site by clicking here. View "vSphere 6.5 Storage" document, in PDF format. Wow, now that's a treasure trove of many great white papers! The navigation along the left edge works well enough, but you may prefer the EXPORT TO PDF button. Now that you've got the document of interest, it's time for me to share the tantalizing bits within that really grabbed my attention, along with my commentary to give a bit of backstory before each quoted-in-green section of his white paper. So with those giant capacities in mind, and my predilection for using RDMs when needed, let's have a read of what VMware has to say about these HDDs. The storage industry is hitting capacity limits with 512N (native) sector size used currently in rotating storage media. To address this issue, the storage industry has proposed new Advanced Format (AF) drives which use a 4K native sector size. These AF drives allows disk drive vendors to build high capacity drives which also provide better performance, efficient space utilization and improved reliability and error correction capability. Given that legacy applications and operating systems may not be able to support 4KN drives, the storage industry has proposed an intermediate step to support legacy applications by providing 4K sector size drives in 512 emulation (512e) mode. These drives will have a physical sector size of 4K but the logical sector size of 512 bytes and are called 512e drives. These drives are now supported on vSphere 6.5 for VMFS and RDM (Raw Device Mappings). ESXi version 6.5 introduces Descriptor Format Sense support throughout its Pluggable Storage Architecture (PSA). This enables better support for larger disk drives and third party plugins, which must use Descriptor Format Sense to report media errors and other check conditions referring to Logical Block Addresses (LBA). Support for Descriptor Format Sense was also a necessary step for pass-through Raw Device Mapping (RDM) device support. This enables a more correct pass-through mechanism. I've witnessed a loose cable induced PSODs first-hand, followed by heroic (and successful) efforts by VMware support to manually recovered that scrogged VMFS. So anything that says journaling might be improved gets my attention, have a look! VMFS-6 is the new filesystem version that is included with the vSphere 6.5 release. In this section, some of the new features and characteristics of this new file system are explored. is ready to fully support the new, larger capacity, 4KN sector disk drives when vSphere supports them. These new mechanism was introduced to address journal issues on previous versions of VMFS, due to the use of regular files blocks as journal blocks and vice-versa. Tracking journal blocks separately in a new resource file reduces the risk of issues arising due to journal blocks being interpreted as regular file blocks. There are also benefits to Thin provisioning operations. Previous versions of VMFS only allowed one transaction at a time per host on a given filesystem. VMFS-6 supports multiple concurrent transactions at a time per host on a given filesystem. This results in improved IOPS for multi-threaded workloads on thin files. Yep, I've got a 10TB drive, I thought it seemed to take on the VMFS 6 format rather quickly, now I know why! You'll also see I've had a thing about 2TB barriers for many years, glad to hear that last barrier has been cleared. Using these new enhancements, the initialization and creation of new VMFS datastore has been significantly improved in ESXi 6.5. For a 32 TB volume, VMFS creation time was halved. Datastore filesystem upgrade from VMFS-5 (or previous versions) to VMFS-6 is not supported. 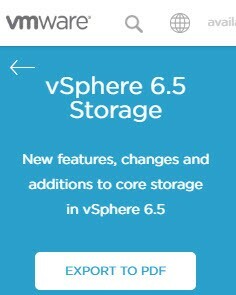 Customers upgrading from older versions of vSphere to 6.5 release should continue to use VMFS-5 datastores (or older version) until they create new VMFS-6 datastores. Since there is no direct in-place upgrade of filesystem supported, customers should use Virtual Machine migration techniques such as Storage vMotion to move VMs from the old datastore to the new VMFS-6 datastore. Prior to ESXi 6.5, thin virtual disks could only be extended if their size was below 2TB when the VM was powered on. If the size of a VMDK was 2TB or larger, or the expand operation caused it to exceed 2TB, the hot extend operation would fail. This required administrators to typically shut down the virtual machine to expand it beyond 2TB. The behavior has been changed in vSphere 6.5 and hot extend no longer has this limitation. It is important to note that this does not require VMFS-6 or Virtual Machine HW version 13 to work. 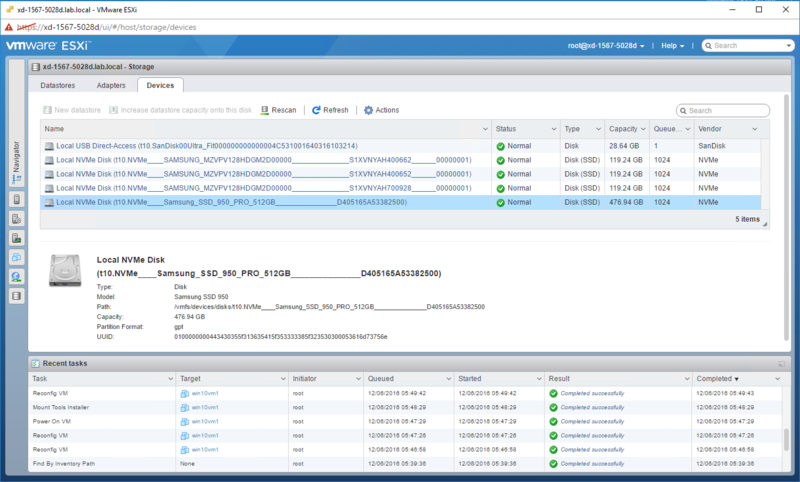 VMFS-5 will also support this functionality as long as ESXi is version at 6.5. 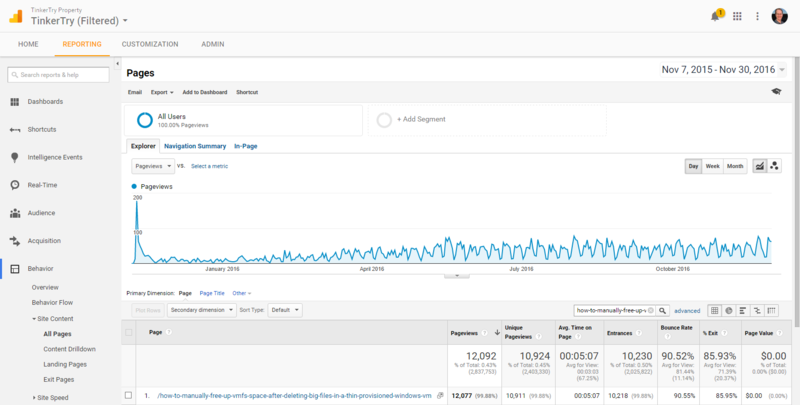 10,000 readers of TinkerTry's reclamation article, and growing! I had thought this was a rather niche topic. I just went and looked anyway, and to my amazement, it turns out 10,000 people have read that year-old article, and growing! I think it's fair to guess that these space reclamations innovations are long awaited improvements. They'll mostly likely have the greatest positive impact on enterprise customers who manage storage arrays that live on SANs. Yes, I'm thinking about the plight of many of my valued customers at my day job too, this is good! In vSphere 6.0, additional improvements to UNMAP were introduced which facilitated the reclaiming of stranded space from within a Guest OS. Effectively, if you have deleted files within a Guest OS, and your VM is thinly provisioned, you can tell the backing storage that you are no longer using these blocks. This allows the backing storage to reclaim this capacity for other uses. 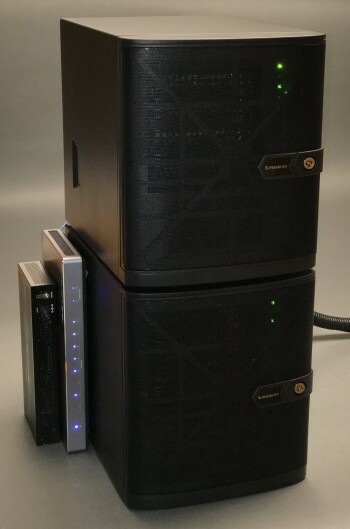 Soon after TinkerTry was born, I posted this article about my first home lab experiment, with the lofty goal of using (expensive/optional/future) encryption capabilities my LSI 9265-8i RAID controller claimed. Well, that never really worked out. Here we are, years later, getting closer to something we can use. 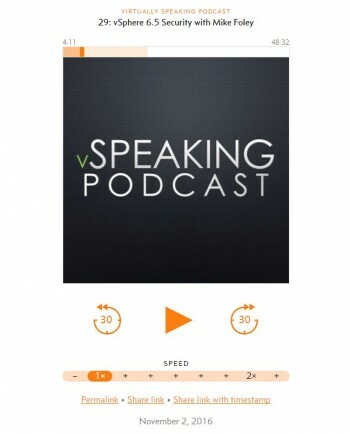 Have a look at my recent conversation with VMware's Mike Foley, where we discuss his recent podcast appearance where he details what's needed to implement VM encryption. Hmm, perhaps this is not as far fetched for a home lab as you might think! vSphere 6.5 introduces a new VM encryption mechanism. This encryption mechanism is implemented in the hypervisor, making vSphere VM encryption agnostic to the Guest OS. This not only encrypts the VMDK, but it also encrypts the VM Home directory contents, e.g. VMX file, metadata files, etc. There are some limitations and considerations associated with vSphere VM Encryption in vSphere 6.5, some of which are highlighted here. Since VMware does not own the KMS, customers are urged to engage with the KMS provider for conversations around backup, DR, recovery, etc. of their KMS. It is critical that some plan is in place to retrieve the encryption keys in the event of a failure, or you may render your VMs unusable. Administrators should not encrypt their vCenter server. This will lead to a chicken-and-egg situation where you need vCenter to boot so it can get the KEK from the KMS to unencrypt its files, but it will not be able to boot as its files are encrypted. Remember, vCenter server does not manage encryption. It is only a client of the KMS. Yep, that's 4 M.2 drives in my Supermicro SuperServer Bundle 2, in one slot! I could have actually had a 5th NVMe drive in the motherboard's M.2 slot, but I ran out. Want to learn and test vSAN, which loves NVMe, but can be rather cost prohibitive to do right? How does a Virtual NVMe Device sound? Now did I got your attention? Seriously, did I? After reading these next sections, please consider leaving your comments below, it really does make everything more fun for all of us! Virtual NVMe device is a new virtual storage HBA which is designed for providing lower IO overhead and scalable IOs for all flash SAN/vSAN storages. NVMe devices are increasingly becoming the primary storage interface for flash-based storages due to its well-designed, low overhead storage protocol and its ability to support scalable IO on multi-core processors. As recent Linux and Windows guest OSes provide much lower I/O stack overhead by skipping SCSI I/O stacks, and leveraging multiple queues with NVMe devices, virtual NVMe device allows VMs to take advantage of such inguest IO stack improvements. Virtual NVMe device provides 30-50% lower CPU cost per I/O and 30-80% higher IOPS compared to virtual SATA device on local PCIe SSD devices. Probably time for me to repair my VMworld-2016-travel-weary, my modest Synology NAS that I turned into a decent RAID0 iSCSI performer. Could be interesting to see what this NFS 4.1 might mean for some NAS owners. Got some more reading to do on that one. One of the major NFS 4.1 client enhancements in vSphere 6.5 is to introduce support for hardware acceleration. In other words, certain operations may now be offloaded to the storage array. This comes in the form of a plugin to the ESXi host that is developed/provided by the storage array partner. Refer to your NAS storage array vendor for further information. So now that we've enjoyed this little journey through my mindset, as I read Cormac's work, what do you think of vSphere 6.5's storage advancements? Let us know, leave a comment below! Supermicro SuperServer Bundle 2 - Xeon D-1541 and Xeon D-1567 two node vSphere 6.5 cluster, with an ASUS 10G switch, and a Ubiquiti EdgeRouter Lite doing DNS/DHCP reservations, for easy VCSA deployment. Doing home vSAN is a challenge, see my updates on this here. to simply and reliably connect the servers directly.